The role of IL-25 in tissue homeostasis, inflammation and immunity to helminth and fungal infection. The interaction between Cryptococcus and host immune responses. The main focus of our research is to understand the cellular and molecular mechanisms by which type-2 immune responses contribute to tissue homeostasis, protective immunity to helminth infection and to the pathogenesis of fungal infection. We are currently investigate the role of type-2 innate lymphoid cells and Th2 cells to understand cellular and molecular mechanisms by which host promotes immunity to Cryptococcus infection and the contribution of host-fungal interaction in disease pathogenesis. To accomplish these objectives we are currently using the combination of techniques in cellular and molecular immunology, protein chemistry, molecular biology, tissue culture and mouse immunology. Understanding and identifying the specific events that occur during host-pathogen interaction will aid our understanding of how these pathways are integrated, regulated, and function. This will help in the identification or treatment of different pathology resulting from alterations in these pathways. Angkasekwinai P*. Allergic Inflammation and Atopic Disease: Role of Th9 Cells. Methods Mol Biol. 2017; 1585:189-199. doi: 10.1007/978-1-4939-6877-0_15. X. Zhang, P. Angkasekwinai*, C. Dong, H. Tang. Structure and function of interleukin-17 family cytokines. Protein Cell. 2011 Jan;2(1):26-40. Epub 2011 Feb 20. (*Co-First author). Y-H. Wang, P. Angkasekwinai, N. Lu, K. S. Voo, K. Arima, S. Hanabuchi, A. Hippe, C. J. Corrigan, C. Dong, B. Homey, Z. Yao, S. Ying, D. P. Huston, and Y-J. 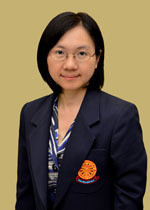 Liu. IL-25 augments type 2 immune responses by enhancing the expansion and functions of TSLP-DC–activated Th2 memory cells. The Journal of Experimental Medicine 2007; 204(8): 1837-1847. (Impact factor 2012= 13.2). S. Chaisavaneeyakorn, P. Kongtawelert, P. Angkasekwinai, R. MacGready, F. Nosten, S. Chaiyaroj. Inhibitory activities of sulfated proteoglycans on chondroitin sulfate A-mediated cytoadherence of Plasmodium Falciparum isolates from Thailand. American Journal of Tropical Medicine and Hygiene 2004; 70(2): 149-157. S. Biswas, A. Escalante, S. Chaiyaroj, P. Angkasekwinai, A. Lal. Prevalence of point mutations in the dihydrofolate reductase and dihydropteroate synthetase genes of Plasmodium falciparum isolates from India and Thailand: a molecular epidemiologic study. Tropical Medicine and International Health 2000; 5(10): 737-743. Chaiyaroj SC, A. Buranakiti, Angkasekwinai, S.Looresuwan, AF.Cowman. Analysis of mefloquine resistance and amplification of pfmdr1 in multidrug-resistant Plasmodium falciparum isolates from Thailand. American Journal of Tropical Medicine and Hygiene 1999; 61(5): 780-783. P. Angkasekwinai, S. Looresuwan, S. Chaiyaroj. Lack of significant association between rosette formation and parasitized erythrocyte adherence to purified CD36. Southeast Asian Journal of Tropical Medicine and Public Health 1998; 29(1): 41-45. S. Chaiyaroj, P. Angkasekwinai, A. Buranakiti, S. Looresuwan, SJ. Rogerson, GV. Brown. Cytoadherence characteristics of Plasmodium falciparum isolates from Thailand: evidence for chondroitin sulfate A as a cytoadherence receptor. American Journal of Tropical Medicine and Hygiene 1996; 55(1): 76-80. 2018: Oral presentation, “Modulation of host innate and adaptive immune response by Cryptococcus infection”, Session “Integrated approaches for overcoming infectious diseases” The 2018 international convention of the pharmaceutical society of Korea October 17-10, 2018, Jeju island, Republic of Korea. 2016: Oral presentation, The 16th International Congress of Immunology 2016 Melbourne, Australia. 2015: Poster presentation, The IMMUNOLOGY 2015™ New Orleans, LA, USA. 2013: Poster presentation, The 15th International Congress of Immunology, Milan, Italy. 2012: Poster presentation, American Association of Immunologists Annual Meeting, Boston, MA. USA. 2010: Oral and Poster presentation, 14th International Congress of Immunology, Kobe, Japan. 2009: Poster Presentation and Meeting Assistant, Keystone Symposium Conference for “TH17 Cells in Health and Disease” Vancouver, British Columbia, Canada. 2008: Poster Presentation, The NIH National Graduate Student Research Festival, Bethesda, MD. USA. 2007: Poster Presentation, 15th Annual Meeting of The International Cytokine Society, San Francisco, CA. USA. 2007: Poster Presentation, Center for Cancer Immunology Research, MD Anderson Cancer Center, Houston, TX. USA. 2007: Poster Presentation, American Academy of Allergy, Asthma, Immunology, San Diego, CA. USA. 2006: Poster Presentation, RIKEN Research Center for Allergy and Immunology International Student Program, Yokohama, Japan. 2006: Poster Presentation, American Association of Immunologists Annual Meeting, Boston, MA. USA.